For this LA Kings team to come away with any sort of worthwhile result against the league-leading Lightning, they’d need a cohesive and hard-nosed effort with all 20 players pulling on the same winning rope or any applicable cliché that depicts their performances in home wins over Vegas and Winnipeg. They received much less than that in a loss based more strongly around a failure to execute a game plan with detail, along with general puck management sloppiness, rather than any emotional or work-related shortcomings. This was the 30th or 31st place team playing poorly against a team that’s eventually going to answer a test as to where it stands amidst the best teams of the decade and perhaps over a longer time span. 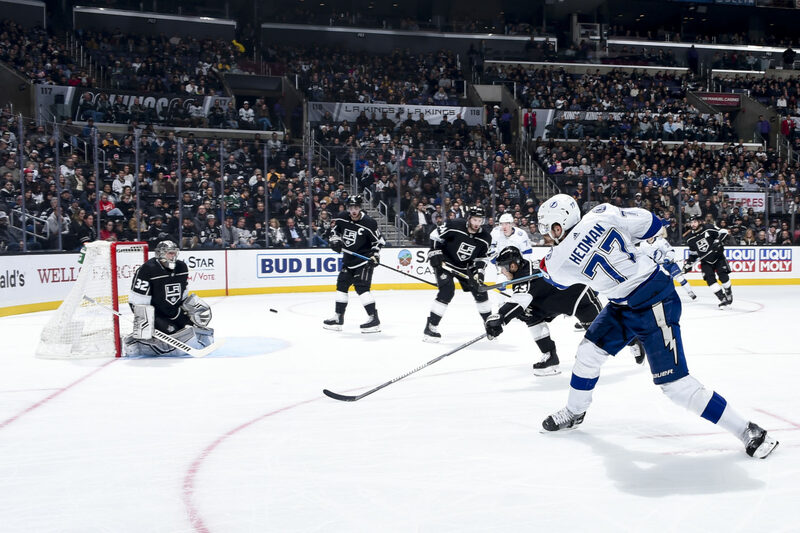 It also began as an ominously similar carbon copy of last year’s game, previewed as a much more compelling billing between the 11-2-2 Kings and 12-2-2 Lightning. 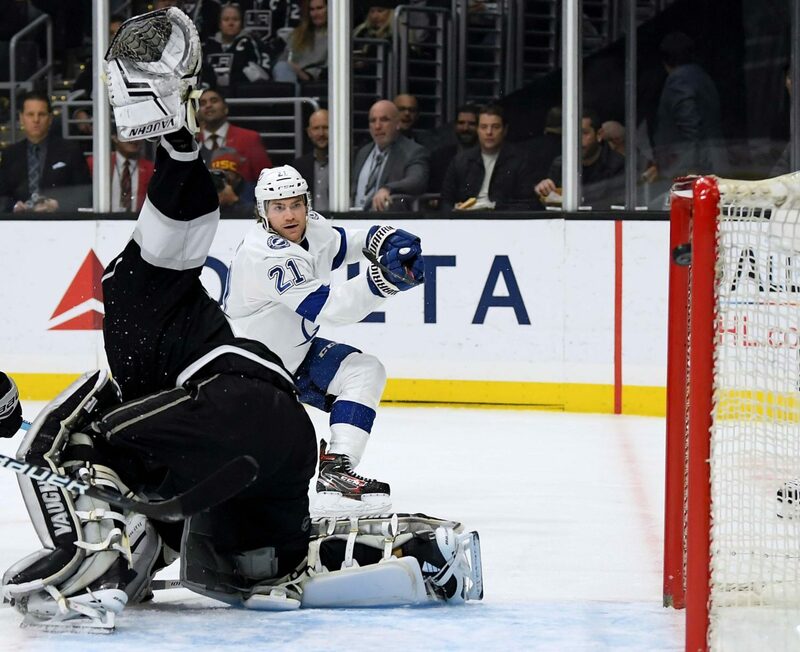 In that game, Anze Kopitar’s early one-timed slam-dunk was fought off by Peter Budaj with one of the best saves he’s ever made at Staples Center; on Thursday, Kopitar gained a step on Brayden Point on the game’s first shift but just missed flipping the puck into a small window between Andrei Vasilevskiy’s left shoulder and the near post on an early drive towards the net. But even if Kopitar scored, there wasn’t a whole lot else in the quiver to suggest it would’ve been anything other than an arbitrary blip. 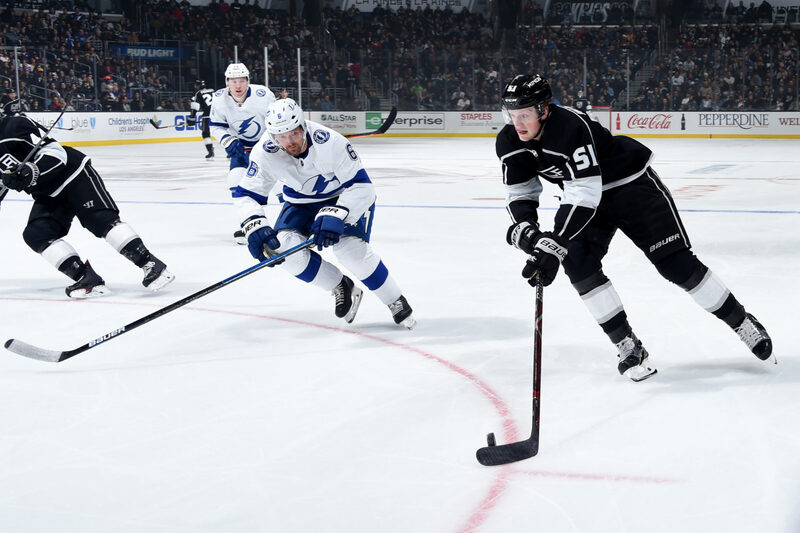 After an even five minutes, Brendan Leipsic was whistled for an offensive zone high-sticking double-minor, and after Dustin Brown had to hook Point to deny a very possible goal, affording the Bolts a two-minute five-on-three and providing a road map of how to lose a game in the first half of the first period. Dustin Brown played the 1,077th game of an NHL career during which the team’s competitive parabola crescendoed into bimodal apexes before its current gravitation back towards the axis. We’re not nearing that directrix – Brown’s hardened and productive play these last two years suggests he’ll still have a pretty firm influence on any upwards ascent in the wake of player movement, acquisitions and, if the proverbial ping pong balls fall favorably, a winning lottery ticket that would also help to bolster the return during roster reshaping. This is basically a geometric way of saying that Dustin Brown Has Seen Some Things, Man, and for him and his teammates and for many Kings fans, a 6-2 non-competitive home loss – the fifth loss by at least four goals at home this year – is another depressing episode for a team whose season ran off the rails in October and is now just teeing off on the back nine. When he faces Edmonton on Saturday, he’ll solely claim the second most games played in franchise history, wedging himself between franchise bulwarks Dave Taylor and Luc Robitaille. He’s a player who entered the league during the fall-out of the promising but injury-ravaged early 2000’s teams – Ziggy Palffy assisted on his first career goal – and has seen empires rise, fall, and rise again, forever and ever Eastasia, Eurasia and Oceania in the parity-rich NHL. He’s not at the age where there should be nostalgic wisps around every corner, but given his longevity and his new milestone among team legends, there is some accentuation to his already stuffed resume as a Stanley Cup winner, two-time Olympian and generous human being and father. There will be some real poignancy in how he views the evolution of the team in the second half of the season, and I’m interested to hear his observations, which always carry weight.